The former Dickson Tavern, located at 201 French Street, serves as the current headquarters of Kidder Wachter Architecture and Design. The building has been stood at that corner for two centuries. When I first read that the proprietors behind the popular local U Pick 6 pubs were developing a new bayfront restaurant with an oyster bar, my first thought was: it's about time. After all, oysters are just as much Erie as a Smith's hot dog or pepperoni ball. Or they were, at least. One can get fresh oysters in Erie if they know where to look, but they certainly aren't the first food that comes to mind when people consider Erie cuisine. Historically though, oysters and other mollusks — both out of our freshwater and shipped in from the Atlantic — have been a staple of the Erie resident's diet. Laura C. Sterrett's The Erie Cook Book, published in 1881, included numerous oyster recipes: fried oysters, broiled oysters, raw oysters, roasted oysters, scalloped oysters, pickled oysters, oyster omelets, oyster soup, oyster stew, oyster salad, oysters on toast, chicken and oyster pie… and even whole turkeys stuffed with oysters. Even into the early 20th century, hundreds of gallons of oysters were being distributed to grocers around Erie each month. The Fulton Market alone, operating at 703 State Street, would sell during a single season around 200 barrels of shelled oysters and over 10,000 gallons of shucked oysters. By then, most were being shipped into the city on ice from the Atlantic coast. Kidder Wachter Architecture & Design is working on the bayfront design that could accommodate the new restaurant with its oyster bar. Interestingly, the architecture firm happens to operate its own headquarters in a building where oysters were once a popular offering during Erie's earliest years: the Dickson Tavern. If one were to speed a DeLorean down French Street and travel back in time 200 years, they wouldn't be able to miss the Dickson Tavern. It was, in many ways, the social heartbeat of Erie in the decades following the War of 1812. The tavern was known for its food — particularly its oysters. At the Dickson, patrons could enjoy their drinks and oysters — often with a side of horseradish and pickles — until midnight. Other offerings, as described by late local historian John Claridge, included "hot coffee, hot and cold meats … tripe, tongue and pastry" as well as "ice cream, wedding cake and punch" for those special occasions. Today, at a glance, the building doesn't seem all that remarkable. 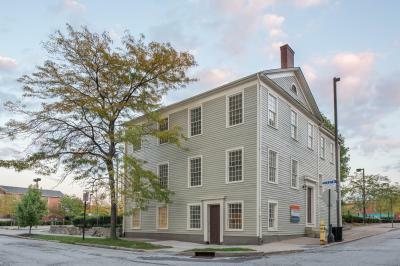 Yet, what was once the Dickson Tavern, and now operates as Kidder Wachter's offices, stands as the oldest surviving building in the city. It sits unassumingly on the corner of East Second and French, resting inconspicuously in the shadows of UPMC Hamot. Other than seeming a bit out of place amid the parking garages and towering hospital buildings, it's easy to miss if you're not paying attention. For over two centuries, though, the building has sat on that corner. Other buildings have come and gone. Many have been destroyed by neglect, acts of nature, or carelessness. Others were simply razed and replaced. There on that corner, however, the Dickson remained. The tavern was named after owner John Dickson. He came to Erie from Baltimore sometime around 1808. According to John Miller's 1909 book on Erie County, Dickson had served in the British Royal Navy under Admiral Nelson, surviving the Battle of the Nile against Napoleon's French fleet in 1798. After arriving in Erie, he spent his first few years involved in trade and sailed the lakes. When the war began, he was captured, but was soon released. He traveled back to Erie, where he built and operated a log-style hotel on French Street. As the war ended, Erie was still little more than a village with a population barely over 500. Still, it was growing. The war had put a spotlight on Erie. Major roads were being built, connecting it to Pittsburgh and Buffalo. Steamboats were coming and going daily. A weekly mail route had even been established. It was just shy of the first anniversary of the Battle of Lake Erie when Dickson purchased the corner plot where he'd have his tavern built. The plot was two blocks north of his log-style hotel and only one block north of the Duncan House, where Oliver Hazard Perry had made his headquarters during the war. Dickson had the north side of the tavern erected the following year, built by future Erie iron mogul William Himrod — whose involvement, as an ardent abolitionist and future founder of Erie's Anti-Slavery Society, has led many to speculate that his design included secret passageways and hideouts for enslaved people on the run. 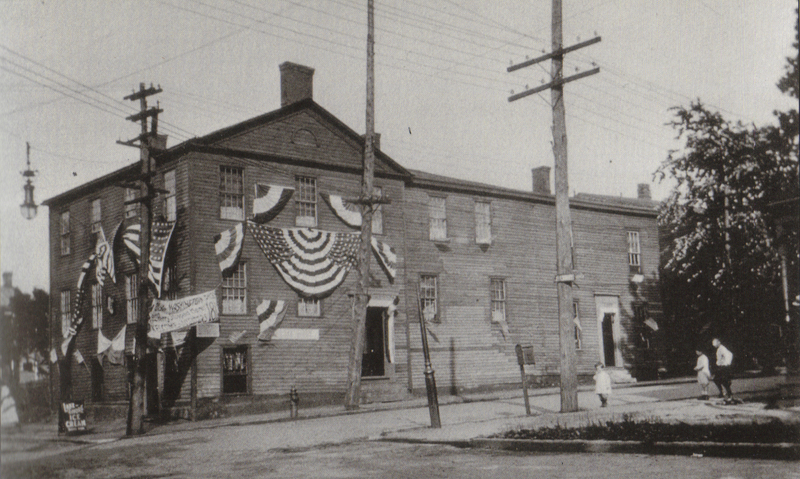 There had been numerous popular public houses in Erie before the Dickson Tavern. Lieutenant Colonel Seth Reed — known for his noteworthy service during the American Revolution — had built Erie's first public house in 1795, a log and stone building at the mouth of Mill Creek. He named it the Presque Isle Tavern. The following year, he built a second tavern for his son Rufus to run at the corner of Second and Parade. The Duncan House had also been around since 1800. Of the few taverns being operated in Erie at the time though, the Dickson Tavern stood out — and for more than its oysters. According to John Claridge, the tavern was "favored by virtue of its size, design, and location" near the busy French Street wharf. It was also one of the only taverns built in a modern federal-style, so it quickly became a central hub where locals could go to relax with a drink, hot food, and maybe even play a game of billiards. Taverns during this period were generally frequented by working class men, but Dickson marketed his business as the Exchange Coffee House, targeting the merchant and business class in Erie. The tavern increasingly became a central gathering place for meetings and banquets and there are even records of Roman Catholic mass and other services being held there. In 1824, Dickson catered the first advertised outdoor banquet in Erie. It was to celebrate the anniversary of the Declaration of the Independence. It was held on a nearby bridge over a ravine on Second Street, just west of the tavern. Dickson planned entertainment and a ball and served the food and drinks. Another banquet was planned for the following summer on June 9, 1825. This event was attended by the famed French military genius of the American Revolution, Marquis de Lafayette. He, along with his son, had arrived in Erie with much fanfare and were set to reside at Daniel Dobbins's residence on Third and State. The banquet was held on the same bridge as the previous year and some attendees later reflected that nearly every single person in Erie must have attended. "The table," Laura G. Sanford wrote in The History of Erie County, "extended the length of the bridge, one hundred and seventy feet, in full view of the lake, and was covered by an awning of the sails of the British vessels taken by Commodore Perry, and handsomely ornamented with flowers and evergreens." The banquet concluded with a toast by Lafayette, in which he proclaimed: "Erie: a name that has great share in American glory, may this town ever enjoy a proportionate share in American prosperity and happiness." In 1829, Dickson moved to Meadville. When he decided to pack up again two years later for Pittsburgh, he sold off the tavern. It passed through a few more hands before being sold to John Rodgers in 1841, who converted it into a home and added the south side of the building. It served primarily as housing for the next eight decades. The city purchased it in 1924 to prevent its destruction and converted it into the Perry Memorial House museum in 1963, which it operated as until 2004. In 2009, Kidder Wachter purchased it from the city and restored it, saving it from inevitable deterioration. Like the Plymouth Tavern today, one could imagine 200 years ago getting off work for the day and telling a friend, "I'll meet you at the Dickson." Once there, drinks would be had. Billiards would be played. Conversation would inevitably turn to the war, the battle on the lake and how it changed everything for Erie. And quite possibly, this conversation would take place over a dinner of fresh oysters…in true Erie style.